Watertown Town Manager Michael Driscoll. Watertown’s budget for the Fiscal Year beginning July 2019 will be $4 million more than the current fiscal year, and include a significant increase for the Watertown Public Schools and funding for the elementary school building projects. 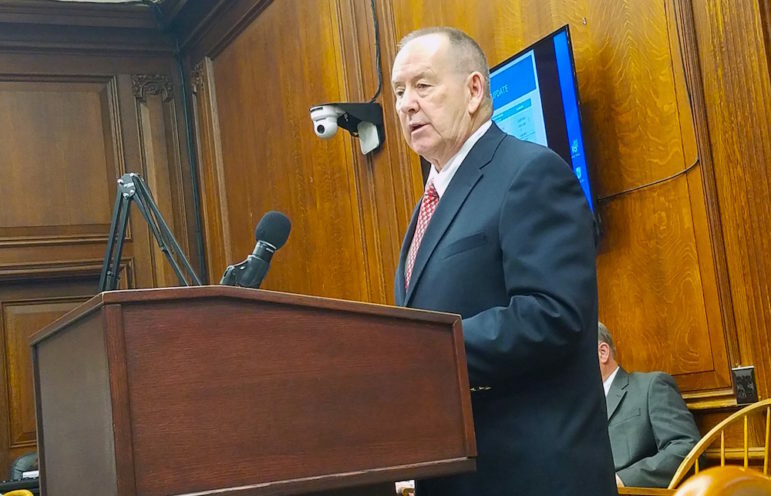 The budget figure for the Fiscal Year 2020 preliminary budget, presented by Town Manager Michael Driscoll Tuesday night, is $147 million. Currently, the revenues in the preliminary budget would fall about $820,000 short of the projected expenditures, but Driscoll said that he has used conservative estimates for revenues, including State Aid. The budget includes a 5 percent increase for the Watertown Public Schools, up to $50.4 million, and a 2.5 percent increase for the Municipal departments, Driscoll said. The total budget in the preliminary proposal is 3.4 percent above the FY 2019 budget. Driscoll also said the FY 2018 came in $2.66 million above what was budgeted, and that amount which will be added to the FY 2019. The increase will be put toward paying off the Town’s deficit in Other Post Employment Benefits, or OPEB, Driscoll said. In prior years, the Town has put millions toward paying off the deficit in Pension costs, including $18.48 million in Fiscal 2019. Watertown has been paying off the pension deficit for the past decade, and will pay off most of the deficit on pensions in FY 2019, and completely pay it off in FY 2020. This will free up money to be spent in other areas. In FY 2020, the money will be split between Pension costs ($8.08 million), OPEB ($12.78 million) and the renovation/rebuilding of Watertown’s three elementary schools ($217,500). Driscoll said Watertown has done something that not many communities could do. “We will pay off the unfunded pension, pay off the Other Post Employment Benefits and pay for the three elementary school buildings, all within the confines of Proposition 2 1/2,” Driscoll said. In Fiscal Year 2021, the pension costs drop to $568,000, while the OPEB goes up to $14 million and the money for the school projects goes up to $6.4 million. The following year, the OPEB will be $8.48 million, and $11.9 million has been projected to go to the school projects. Last year, Driscoll committed the town to spend between $80 million and $120 million on the elementary school projects without a Prop. 2 1/2 debt exclusion. However, costs appear to be significantly higher. He said there may be a way to increase the budget. “If it is higher than $80 to $120 million, we will review it with the School Building Committee, the Town Council and the School Committee,” Driscoll said. The $2.6 million increase comes from a variety of areas, including an increase in real estate and personal property taxes of about $267,000 above what was anticipated in FY 2018. Some of the new additions to the tax base are the Linx Building and three research and development buildings came on line, Driscoll said. This will be added to the FY 2019 budget, and remains in the FY 2020 preliminary budget. Also, in the recently completed FY 2018, the town took in about $162,000 more than expected in excise taxes ($707,424), mostly from the Residence Inn by Marriott. With all the development in town, the fees taken in by the town came in about $500,000 higher than budgeted in FY 2018, a total of $4.18 million. Plus, the town’s investment income was $300,000 higher than projected, for a total of $527,793. One area that came in significantly lower than budgeted in FY 2018 was Fines and Forfeits, which was $172,000 less than anticipated, at $583,593. Driscoll forecasts a 5.5 percent growth in real estate and personal property taxes in FY 2020. This makes up about 78 percent of the budget. The preliminary budget, however, calls for the same level of State Aid, $12.3 million, as Fiscal Year 2019. See Town Manager Michael Driscoll’s Fiscal Year 2020 Preliminary Budget Presentation by clicking here. in the town? How come our taxes are not going down? Paying off the unfunded pensions, paying off the Other Post Employment Benefits and paying for the three elementary buildings, all within the confines of Proposition 2 1/2. of the top Town Managers in the state. Keep up the Great work Mr. Driscoll. I concur with John Airasian. Well done Mike!